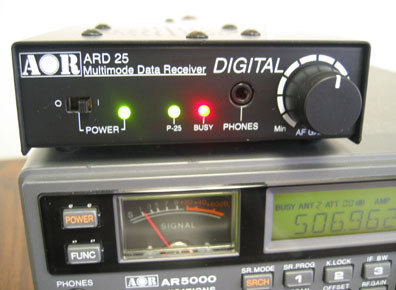 The AOR ARD25 can decode APCO 25 digital signals (excluding encrypted signals). It converts your analog receiver (if equipped with a 10.7MHz IF output) into digital receiver without any modifications to the receiver! By applying speaker audio output from your receiver to the ARD25, it will automatically recognize if the received signal is analog FM signal or a P25 digital signal. The compact ARD25 has a built-in speaker and comes with the AOR AR8600 AC power supply. You will also get a coaxial BNC to BNC cable and an audio cable with a 3.5mm mini plug at each end. Please note that the ARD25 does not support trunk tracking, nor will it decode APCO25 transmissions on trunked systems. Receive Mode: APCO Project 25 digital voice signal (No encrypted signals). Copyright 2001-2018, Universal Radio, Inc.